Home / Resources / Highway History / General Highway History / Where was the First Walk/Don't Walk Sign Installed? Where was the First Walk/Don't Walk Sign Installed? The Highway History page recently received an inquiry about where the first Walk/Don't Walk sign was installed. This question has come up before, but we've never been able to find the answer. Our research helped pin down the time frame (late 1930's), but not the location. The Highway History page does not like to fail, but here's a summary of the research-for what it's worth. During the 1930's, city officials were trying to figure out how to reduce the death and injury toll among pedestrians. For example, cities began passing laws establishing that pedestrians have the right-of-way under certain circumstances. When that didn't work, they tried physical means, including barriers to prevent pedestrians from crossing where they weren't supposed to cross. The new system eliminates all turns on the red light. It provides every 100 seconds a 20 second period in which, with the lens shining yellow and the hand red, all motor traffic is stopped while pedestrians cross at the four corners. This is followed by a five second interval, lens dark and hand shining red in each direction, in which pedestrians clear the intersection. Then vehicles move east and west for 30 seconds. Again, traffic moves for five seconds, when north and south vehicular traffic is given the green light for 58 seconds. A two second hiatus in which neither pedestrians nor vehicles may proceed, completes the 120 second cycle. Dr. Harriss believes that the illuminated hand which forms a distinctive part of his signal device will be an improvement over the round red lens, which is used at present. To many motorists, he holds, a red light often indicates danger or detour, and not definitely stop. Many are in the habit of starting out while the signal is still red. Dr. Harriss hopes the new signal will eliminate a source of irritation and danger when drivers fail to see, or claim they have failed to see, the traffic officer's uplifted hand. The lighted hand should also, he thinks, curb the practice of passing a red light, which he believes to be one of the most dangerous and serious violations of the traffic rules and the cause of thousands of deaths and injuries . . . . The great majority of cities in the United States, according to Dr. Harriss, use the light signal system prevalent in New York City at the present time. There has been considerable experimentation with the extra yellow light, some cities using the amber signal as a cautionary sign; others, such as Boston, Los Angeles and San Francisco, as a crossing light for pedestrians. Among cities abroad, Paris has used the combination of one red light followed by a dark lamp, while London and Berlin use modifications of the red, green and yellow system. Under the old control, we had to wait, first on one foot and then on the other, for the long period of the red light to expire. Then we were allowed a long period of green. We were subject to the interference of turning vehicles, and sometimes, if we did not complete our crossing on the green, we were caught in the middle of traffic, some of which might have been "jumping" the amber. Perhaps we became too impatient and tried to cross against the light. Then we had a merry chase through traffic which was "hitting it up" in order to get the greatest possible distance on the allotted time. Under the new system, a "Walk" light shows during a part of the time that the green light is burning for traffic moving in the same direction as ourselves. According to W. C. Brandes, City Traffic Engineer, this signal is so timed that if, in crossing Michigan, we step from the curb before the "Walk" light goes off, we should have time to reach the safety island before the traffic in front of which we have been crossing, gets the "Go" light. We are, however, still subject to interference from turning vehicles. Whereas, under the old system, traffic on both sides of Michigan stopped and started together, under the new, at half of all the intersections, traffic may be stopped on one side and moving on the other, so, it means the pedestrian may cross only one-half of the street at a time, spending a few seconds on a safety island. Pedestrians complained that they were forced to wait on the island, although Mr. Brandes indicated their overall time was better under the new system. Some pedestrians did not understand that the "Walk" signal applied only to their side of the avenue, so the city placed lighted signs on top of the signals informing pedestrians how far to walk on each signal. For several years cities in different parts of the country have had varying successes with the regulation of pedestrian traffic by Stop and Go signals. Some cities have had not only legal requirements but a large measure of voluntary obedience, and in such sections the actual control of pedestrian traffic by signals is usually successful. In other cities general opinion is that such control is not practical and cannot be imposed upon pedestrians. One generally acceptable principle is that unreasonable delays due to unnecessarily long cycles of operation of Stop and Go signals are conducive to disobedience by pedestrians. This has been one of the large factors in reducing the length of cycles to the minimum which will handle traffic successfully. Another development in the use of Stop and Go signals for pedestrian aid and protection is the pedestrian walk light. Formerly, this was incorporated into the cycle as a separate phase for pedestrians to walk in all directions during which no vehicular traffic might move. However, this tended to increase greatly the total length of the cycle because it added to the time required for vehicles to move [and] the time required for pedestrians to move in all directions and did not enable pedestrians to take advantage of the opportunity to cross with the green light. This type of special pedestrian signal has generally been discarded in favor of the type which operates in conjunction with the green light at the ordinary four-way intersection. It allows pedestrians to cross in the same direction and at the same time as the vehicles with the exception that the special pedestrian light (usually white or purple) goes off a few seconds before the green changes to yellow because it requires a longer time for pedestrians than for vehicles to clear the intersection. At special types of intersections where there is almost a continual flow of vehicles across the crosswalks, it is necessary to install special pedestrian walk signals if there is appreciable pedestrian traffic and protection is necessary. In such a case it is usually necessary to operate the walk signals as a separate phase of the cycle. To be most successful for pedestrian obedience a Stop and Go signal should have a face toward each direction of pedestrian movement. If signals do not face all movements, the pedestrians going in certain directions will have to depend upon the indications of signals at right angles to their direction and, thus, be in danger of becoming confused and disobeying the signals inadvertently. In these examples, the references to walk lights do not appear to mean the lights had a "walk" or "don't walk" on them. It appears the cities were attempting to accomplish with lights what would later be accomplished by the Walk/Don't Walk signs. An article in The New York Times for December 4, 1938, described an initiative to stop jaywalkers: "Pedestrian control signals reading alternately "Wait" and "Walk" will be installed in Times Square, at the intersection of Broadway and Forty-fifth Street, about Jan. 1." 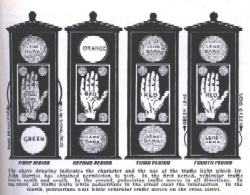 In my limited research, this is the earliest reference I found to a form of Walk/Don't Walk sign, but that does not mean it was the first in the country. Gratified at the success of the elaborate pedestrian walk-light system recently installed at the busy intersection of Thirteenth street and Pennsylvania avenue N.W., Traffic Director William A. Van Duzer said today he is pushing plans for installation of similar "walk" and "don't walk" neon signs at other congested corners. A pedestrian walk-light system recently installed at the busy intersection of Thirteenth street and Pennsylvania avenue N.W. The city had tried bright neon walk lights for the pedestrian signals at Twelfth and 13th Street, but Mr. Van Duzer said they "have never been very successful, largely because they aren't prominent enough to hold the pedestrian's attention." He added, "The larger and brighter neon signs are working out much better." 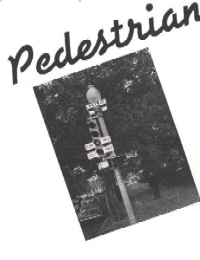 An article by Van Duzer on regulation of pedestrian traffic appeared in the February 1940 issue of Public Safety. Although he did not discuss signs, the article included two photos of the traffic pole at 13th Street. They show a traffic light with four lights (including a right turn signal). Below it is a separate sign illuminated for "walk" in one photo, and for "don't walk" in the other. Neither the article about New York City nor the District of Columbia claimed that its installation was a "first" nationally. However, they help to pin down the time frame of 1938-1940 for the origins of the sign.